Catalogue of the exhibition, Le Cabinet de L'Amateur, Paris, Orangérie des Tuileries, Feb. - April, 1956, Editions des Musées Nationaux, p. 12, no. 40. F. Zeri, La Galleria Pallavicini, 1959, pp. 118 under no. 197. S. Bébuin, L'Ecole de Fontainebleau: Le Maniérisme à la Cour de France, 1960, p. 107. Catalogue of the exhibition, L'Ecole de Fontainebleau, Paris, Grand palais, Oct. 17, 1972 - Jan. 15, 1973, pp. 213-4. Tacitus (Annales, XIII) describes how the Empress Poppaea, wife of Nero, habitually veiled her face - but only partly - in public 'either because she wished to arouse curiosity in onlookers, or simply because it suited her'. However, the transparent veil, or Roman gauze, was traditionally associated with courtesans rather than empresses. This sophisticated coquetterie provides a perfect subject, given the highly-charged, ambiguous symbolism which was a frequent element of the painting of the Fontainebleau school artists. For some time Sabina Poppaea was thought to be a portrait of Diane de Poitiers, who with Henri II was responsible for the first persecutions of Protestants in France, as Nero and Poppaea were for the Christians in Rome. This theory, while intriguing, seems without foundation, and Gébelin suggests that the iconography has its source in the antique bust in Naples known as La Zingarella, itself supposedly a portrait of the empress (Gébelin, Le Style Renaissance en France, 1942). It seems more likely that the subject is merely a response to the highly refined, overtly sexual eroticism, for which the historical subject provides a learned pretext. 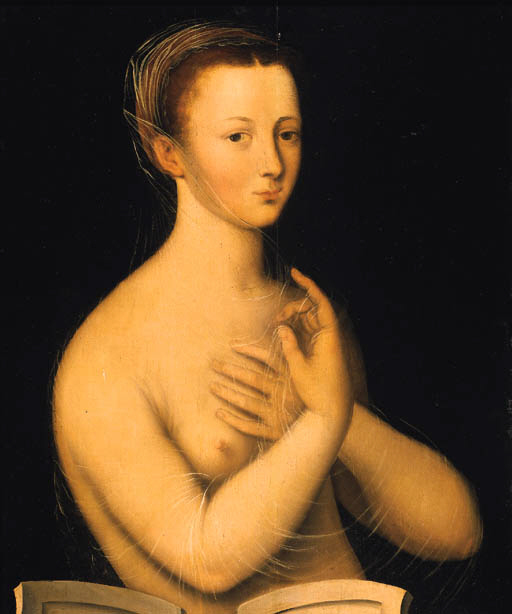 Iconographically, the composition is one of a series of similar half-length female nudes, a significant innovation of the Fontainebleau school in French art. See, for example the Double Portrait of Gabrielle d'Estrées and one of her sisters in the Musée du Louvre, Paris, Inv. no. 1937-1. The present work is a version, with differences, of the composition of circa 1550-70, in the Musée d'Art et d'Histoire, Geneva in which the Empress Poppea stands before a cartouche bearing her name.